Advertising your webpage can be tricky. There are a multitude of ways you can make your site more visible (and, therefore, more visited) but it’s hard to know where to start. Whether you just created your page or you’ve had it a while, it’s never too early (or too late) to make use of keyword advertising. Keywords are incredibly helpful tools which allow web users to be more accurately matched up with exactly that they’re looking for, and this is a two-way street. By using keywords, you can get your page more often matched up with people that are looking for it. One of the most powerful tools in the industry of keyword advertising today is ‘Google Keyword Planner’, which is a relatively simple and worry-free bit of software that uses keywords to generate very valuable information about consumer web searches and even leads for your business. If you really want to up your game, it’s time to start using Google Keyword Planner. 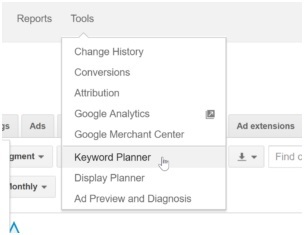 Head to ‘https://adwords.google.com/KeywordPlanner’ and hit “Create an account” up at the top-right. Then, enter in the basic information required and click “Continue”. The signup process is pretty simple and intuitive, as is the norm with Google services. 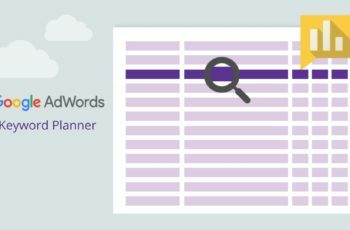 Once you have your account, you’re ready to try out the Keyword Planner! Once you’re signed into your Google Adwords account, select ‘Tools’ from the toolbar on the top and hit “Keyword Planner”. These three powerful tools are all you’ll need for your SEO (‘Search Engine Optimization’) research. Now it’s time to bust them out! ‘Your product or service’ is where you will enter 1-3 keywords to use as ‘Seed keywords’ from which to generate the best possible keywords for you to use. Try to use very specific niche keys that distinguish your product or service from the competition: “vegan breakfast” or “european chocolate”, for example. ‘Your landing page’ is where you’ll put the link to your website, preferably the homepage. This can help generate better results. ‘Your product category’ uses Google’s internal database of market categories to give a general label to your product or service. You can often find keywords you may not have thought of in this section. This is the section where you narrow down your target audience. Simply select the primary country, language, and search engine (usually Google) that you want to generate data for. Finally, you’ll see ‘Negative Keywords’, which is where you select which keywords you don’t want to advertise with. This can help you avoid unwanted associations. 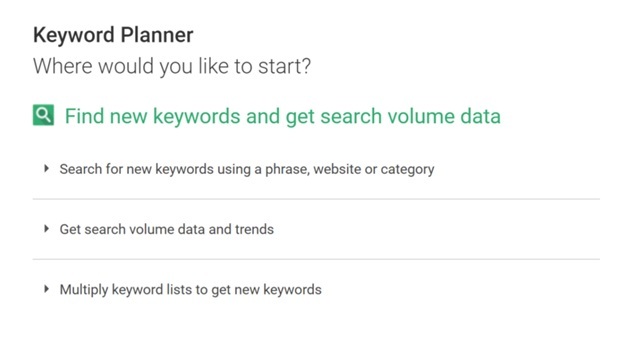 Here you can use ‘Keyword Filters’ to filter for additional keyword criteria, ‘Keyword Options’ to decide how broad you want the search range to be, and ‘Keywords to include’ to make sure any specific keywords you are certain you want to use will be added. Then, it’s time to hit ‘Get ideas’ and see what new keywords Google has found for you! This tool, while not helpful for generating new keywords, is incredibly useful for narrowing down a list of keywords you already have by showing you their search popularity. You can copy and paste word lists or upload a file that contains a list of keywords. This tool also includes the same ‘Targeting’ option as the previous tool, which will help you hone in on the most applicable results. When you’re finished, hit ‘Get search volume’ and check out the new data Google has for you! This funky little tool smashes groups of keywords together to figure out every possible search combination someone would use to look for your product. While it often gives back complete nonsense, it will also sometimes give you that Holy Grail of keywords you’ve been looking for all your life. To use it, simply enter a list of keywords into ‘List 1’, then a different set of keywords into ‘List 2’, and if you want to you can click the grey ‘X’ on the right to add a third list for yet another group of keywords. After you’re done here, you can modify your ‘Targeting’ options in the same fashion as the last two tools. Once you’re done here, hit ‘Get search volume’ and see what brand new keywords this tool has created! After using any of the three aforementioned tools, you will be brought to the keyword results page. Immediately on the left is the same set of filtering options you’ve seen in the tools above. 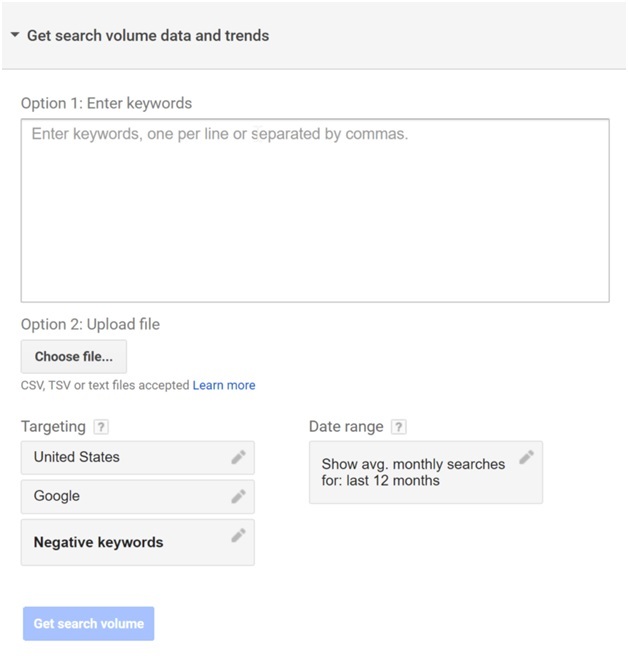 Using them now allows you to decide on things like search volume thresholds after you’ve seen the data. The ability to work with feedback will always be one of a marketer’s greatest assets. You will see two tabs: ‘Ad group ideas’ and ‘Keyword ideas’ – be sure to fully utilize them both. 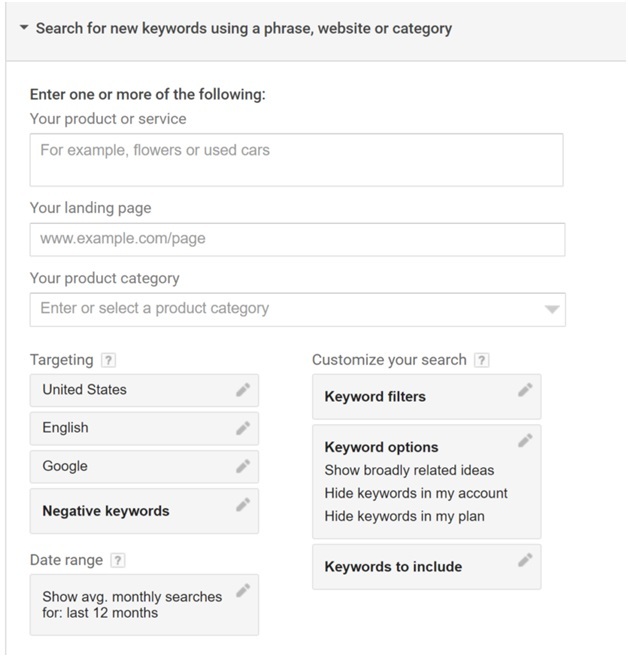 Your keywords will be sorted by relevance and show you a pretty broad range of average monthly search volume. One thing to keep in mind is that certain terms have dramatic changes in their search popularity depending on the month (or season), such as “thanksgiving stuffing recipes” and “halloween costume ideas”. Averages can be misleading, and if you want to see more specific search volume for a keyword, select that keyword and hit “Add to plan”. On the right, you will see a sidebar displaying your plan. Click the “Review Plan” button, then enter an astronomically high bid (>$200), and then check “Impressions” to see the estimated daily hits for that keyword. Multiply by 30 for the estimated monthly hits. Both ‘Competition’ and ‘Suggested bid’ are indicators of how marketable or profitable each keyword is. They tell you how many other people are using them to sell something (commercial intent) and what the average value of that keyword is. Now that you have your data, you can make decisions about which keywords are right for you. Keywords with higher search volume, competition, and suggested bids will in general bring with them a higher conversion rate. The world of advertising can seem like a constant battle, but with these formidable tools at your disposal you can wield the most powerful weapon of all: knowledge.